on those living in the land of deep darkness, a light has dawned. Christmas. It’s a time of decorations and dinners and presents, and lights, but it comes during a dark time of year. The shortest days, the longest nights. But into the night came the baby Jesus, born under a great light in the sky, a light that heralded his birth. And the ones who responded, who received God’s message and went to see the baby Jesus, they were not the ones who should have recognized the signs. No, the ones who thought they knew the most about the coming of the Messiah, they missed it entirely. And Jesus came into that darkness. The darkness of the night, the darkness of the world, the darkness of our hearts. To bring us light, to be the Light. Last week, with the first message in the series, Pastor Mark focused on the miracle of Incarnation, and we talked about God’s grace, and that even though grace came through the sin of disobedience in the Garden of Eden, it was delivered as forgiveness in the manger in Bethlehem, and that grace came in the person of Jesus, God himself, incarnate, living among us. A true miracle! Today, we will talk about the miracle of Light. You may be wondering, light is a miracle? Light is something that seems so common that it’s probably rare that we really even think about it. It’s usually all around us, and we take it for granted, at least until we need it. We flip a switch, and it’s there. The sun comes up, and it’s there. But scripture tells us that light is actually very special. Let’s explore why. Have you ever been in a place that was completely dark? I mean, really dark. You know, when the power goes out during a storm at night, it can be pretty dark. Or if someone turns off the lights in a room on you, it can be pretty dark, and you have to wait a few moments before your eyes adjust and you can find your way out, or at least find your way to the light switch. Or have you ever taken a walk on a moonlit night? It seems dark at first, but then pretty soon, your eyes adjust, and you see the world’s beauty in a whole new way. But that’s not really dark, is it? No, I mean dark like during the tour at Mammoth Cave when they get you way in there and then turn out the lights. If you’ve ever gone there, then you know what I’m talking about. That’s really dark. There’s no light at all. Absolutely none. There’s no letting your eyes get adjusted and then you can see a bit, either. No, you can’t see anything, no matter how close it is to you. You’re so far under ground that there’s no light to adjust to. It’s completely, totally dark, and you’re surrounded by blackness. And that’s another thing about that kind of darkness. It’s not just dark, it’s alone. In a place that dark, it’s very hard to sense the presence, the nearness, of anyone, of anything else. And that’s part of what makes it so unsettling. I experienced that for the first time when I was a child, when my parents took our family on a trip to Mammoth Cave, and I have been there a few times since. The experience never ceases to amaze me. And as I read the news about the young soccer team and their coach who are trapped in a cave system in Thailand, I can’t help but think of the darkness that has enveloped them as they hope and wait. And the joy they must have felt at the first light of the rescuers who are working to get them out. There are other kinds of darkness, too. Have you ever been in a place of darkness in your life? A time when you have experienced great loss, or great disappointment, or great uncertainty? A time when you felt like there was more on your shoulders than you could bear, when you perhaps felt all alone in your situation? A time when you maybe even wondered where God was in all of it? Well, whether we admit it or not, whether we recognize it or not, most of us have been in a place like that. We may even be there right now, at this very moment. Wondering what to do, wondering how we can carry on, wondering how long we can continue to put one foot in front of the other. It is a reality of the human condition, a fact of life on this earth, that at some point in our lives, most of us will be in a place like this. A place of despair, a place of deep spiritual darkness. Yes, darkness is real, whether it is literal or spiritual, and the absence of light can mean fear, or despair, or even the loss of hope. When there is no light, you can’t see the way. You can’t even see if there is a way. Can’t you just picture that scene? The excitement of setting out on an adventure, the shock and fear of the little boy when the lights went out, the calm assurance of his big sister. And the little boy, hearing that familiar, loved voice, then knew that all would be well. Someone knows how to turn on the lights. And not only does someone know how to turn on the lights, Someone has, right? Jesus Christ is that person. Jesus has turned on the lights! Jesus came to be a light, but more than that, Jesus is Light. Jesus Christ came into the darkness. He joined us here. To bring us light, to show us that he is the Light. And that kind of darkness was very real to Isaiah’s audience, too. The northern kingdom had been conquered by the Assyrian Empire, and many of the people were taken into exile, and so the fear and despair, the darkness, of God’s people, it was real, and it was deep. But Isaiah was a prophet, and so the darkness he described was also understood in both personal and communal terms, not just in a political sense. Isaiah was calling on them to recognize the darkness of the sin that had corrupted their spiritual lives, and the darkness of their social sin and their national tragedy. And, amazingly enough, it is against this background, against this darkness on every level, that Isaiah heralds the dawning of the Light. We know darkness, too, don’t we? We see many good things around us, but we also see that the world in which we live is broken. That there is much darkness. Ours is a world of beauty and love, but it is also a world of war, and of violence, and of fear. It is a world of the wrongful use of power. A world where we see even those who claim to be Christians not living and leading as Christ directed. And lest we become too smug, we must confess that we know not just the darkness of the world, but the darkness of our own lives as well: the darkness of family quarrels and stresses, the darkness of disease and death, the darkness of fear and guilt, of loneliness, of uncertainty, of hypocrisy, of willfulness, of self-centeredness. Yes, we know the darkness of sin. And sin is more than just wrong choices. If only it were that easy! No, sin stems from a state of alienation from God, which causes spiritual blindness and darkness. Darkness in our lives, and darkness in our world. And the only remedy for sin, for the darkness of the world, the darkness of our hearts, is a conscious return to the Light, into the life of the Son. And Jesus Christ is that miracle of Light. A light in the darkness, bringing his Light, into the darkness, to us, to the world. Christ brings us the true Light in his very self. He is a great Light who shows us the Way. Jesus Christ came into a dark world, as the Light, to be a light, to show us God. Yes, Jesus came into the darkness. Into the night, into a world that didn’t see God, into our darkened hearts. Jesus is Light, and that Light can shine even on the things we don’t want others to see, even the things we think we can hide from God. And the miracle is that Christ is Light, but Christ is also with us in that darkness. Darkness is under God’s control. We are not alone, and nothing is hidden from him. The darkness would overwhelm us if we were left to ourselves and our own efforts at self-improvement, but there is Someone who knows how to “turn on the lights.” That Someone is the Light, the Light that was in the beginning, the Light who came to us as a baby over 2,000 years ago, the Light that came into the darkness. The Gospel of John tells us that Christ is the Light for all people, that the Light shines in the darkness, and that the darkness will not, the darkness can not, overcome it. This message is consistent throughout all of scripture, too. The Psalms tell us that the Lord is our Light and our salvation. In Matthew and John and Isaiah and Luke and the letters of Paul, from the Old Testament to the New, Christ is the Light, the Light eternal. Yes, Christ is the miracle of Light, but do we live in such a way that Christ’s inextinguishable light is evident? Do we bring hope and assurance to those who feel overcome by the darkness of the world? Are we willing to encounter people in order to bring hope to those who feel overwhelmed by darkness? The Light was born for us, for all of us, and the Gospel of John says that as Christ’s followers, we are to walk in the Light. Are we willing to enter into the dark places in our own hearts, to invite the Light to meet us there? Are we willing to show the world that the Light is with us, that we believe the promise of the Light? That is what Christ calls us to do. But frequently, the church, we, are more like the little boy, trembling at the depths of the darkness. And that may in fact be the easier path—to feel so overcome, so overwhelmed by the darkness that we can’t recall the power of the Light. But that is the path of hopelessness and despair and darkness. We must be like the older sister, remembering that there is One who not only knows how to turn on the lights, but who is truly the Light. And he is Jesus Christ, the one we know and love. But there is a gap between what is and what ought to be. And we know that, don’t we? Every time we see injustice, every time we experience the pain of a broken relationship, every time a loved one dies, we know that there is a darkness. We know the world is not as God planned. But Christ invites us to imagine the world as God intends it. Scripture tells us, and our encounter with Christ assures us, that the darkness cannot prevail. And Christ invites us to participate with him in his work. and the prophet Isaiah tells us that the people who walk in darkness, we, the world, will see a great Light—a Light that will shine on all those who live in the land of the shadow of death. This is the meaning of Christmas. The meaning of Christmas is found in this passage. To paraphrase one of Martin Luther’s messages from the 16th century, this passage helps us understand how to make use of the Christmas story, the story of Christ’s birth. And this is no sentimental, ethereal, naive feeling. It’s not an opinion. It is a radical, prophetic claim that is consistent throughout scripture. It is Truth. The prophet Isaiah shows us both the world as it is and the world as it can be, as God intends it to be. Isaiah acknowledges the brokenness around us, but he also shows us the hope of the Light of Christ. The prophet Isaiah, the Gospel of Luke, all of scripture, tells us that because of our God’s deep compassion, the dawn from heaven will break upon us, to give light to those who are sitting in darkness and in the shadow of death, to guide us on the path of peace. 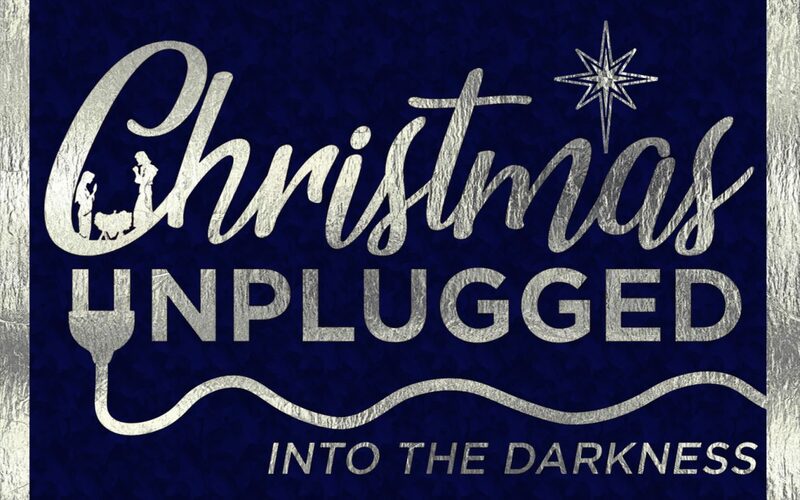 And that is Christmas Unplugged. We’re not putting up lights right now. No lights on trees or wreaths or mantles or houses. No, we are unplugging those lights this summer. But as we celebrate Christmas this July, let us reflect on the brightness of summer, on the days of long sunshine, and on the Light of the world. Let us celebrate the miracle of Light, the Light of Christ come to us as a baby, for us, for everyone.